This course is an ICF Approved Coach Specific Training Hours Programme (ACSTH), meaning the ILI Diploma in Personal and Business Coaching is a recognised coaching qualification worldwide and is approved by the world's leading coach and coach training accreditating organization. 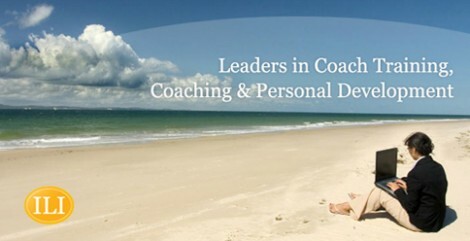 "Founded in 1995, the ICF's core purpose is to advance the art, science, and practice of professional coaching. As the leading global coaching organization, the ICF is working toward this goal by setting high standards, providing independent certification, and building a worldwide network of credentialed coaches" (ICF website). Coaches qualifying from the ILI course can apply for accredited membership of the International Coach Federation and other international coach accrediting bodies having fulfilled their respective minimum accredited entry requirements. This Level 6 Award in Coaching will be very beneficial to any coaches operating in Ireland. 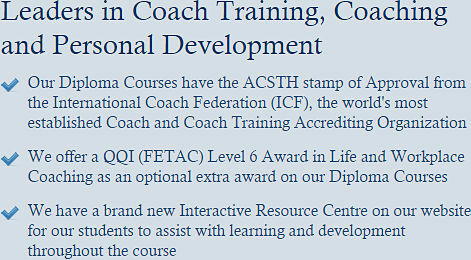 It is another full course in coaching consisting of 3 Component Awards but we in the ILI have woven the QQI specifications, learning objectives and outcomes for this Award into our Diploma Course allowing you to effectively complete 2 coaching courses simultanuously with very little extra work and time required. Please note that this award is optional and there is an extra fee of €450 due by the midpoint of the course. As part of QQI’s policy for the protection of its learners, in the event that the Irish Lifecoach Institute ceases to provide or fails to complete this training programme, we have agreed with two other providers, that they will provide or complete the training at no extra cost to the student. These arrangements have been agreed with QQI (FETAC). Furthermore, all data between the student and the training provider which is confidential would be shared only with the new provider in order to allow the training to be completed properly.